Gram flour, also known as garbanzo bean flour, chickpea flour, or besan, is a pulse flour made from ground chickpeas. Used in many countries, it is a staple ingredient in Indian, Pakistani, Nepali and Bangladeshi cuisines. Hi friends! 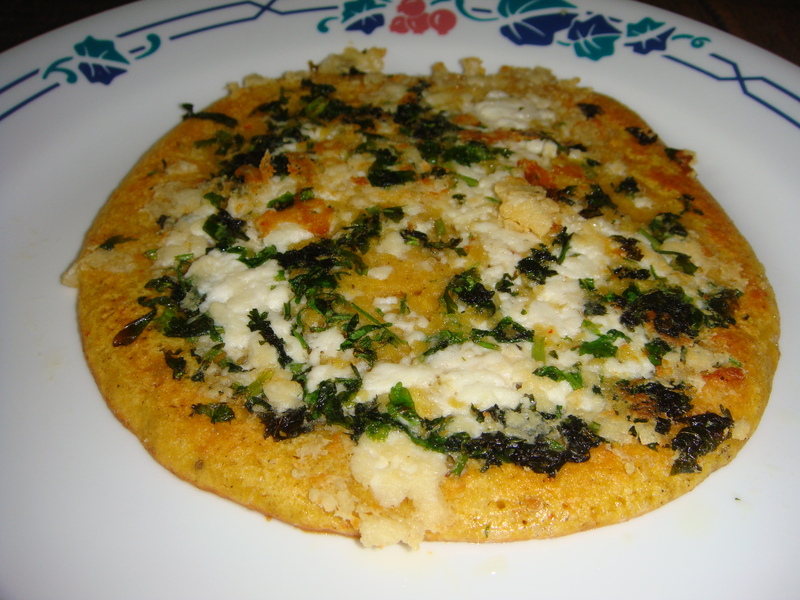 Gram Flour / Besan Uttapam is a tasty dish for breakfast or as a snack. This recipe is easy and quick to prepare and can be served with coriander / cilantro chutney. It is a favorite dish of the family for breakfast, folded with cheese. Grate the the cottage cheese/ paneer and keep aside. In a mixing bowl take Gram Flour / Besan, rice flour , add salt, baking soda, carom seeds, coriander powder, red chili powder slowly add water mix to make a smooth batter. The mix consistency of pancake batter or Dosa batter. Take a non-stick pan /tava and place on medium flame. To check the heat level required, test by sprinkling a few drops of water on it. Water should sizzle right away. Pour about 1 ladle of the batter onto non- stick pan / tava stick and spread evenly with a back of ladle. Starting from the center, with spiral movement spread the batter outward evenly to form a circle about 6″ in diameter. Immediately after spreading the batter onto non-stick pan /tava , spread evenly two tbsp grated cottage cheese/ paneer, 1 tsp finely chopped cilantro / coriander leaves on the dosa. When batter starts to dry a little, slowly spread little cooking oil over and around it. After 30 seconds; flip the uttpam using a flat spatula. Press the uttpam lightly all around with the spatula to make the cheese and uttpam cook evenly until crisp and golden brown on both sides. Repeat the process for the remaining uttpam. Serve uttpam hot with cilantro / dhania / coriander chutney. Quick spread of the batter on hot non-stick pan / tava, will make the spreading easier and will give better results. Besan flour, or gram flour, may not sound familiar until you hear its third name: chickpea flour. The characteristic nutty flavor from finely ground chickpeas gives besan flour the ability to create tasty, simple breads that stand on their own with few ingredients. It also stands above wheat flour in protein and folate content. Besan flour is naturally higher in protein than wheat-based flours. One-half cup contains 10 grams of protein, compared to 8 grams in whole-grain wheat flour and just 6 grams in white flour. One-half cup of besan flour has 178 calories and 3 grams of total fat. Even though that’s double the fat of whole-wheat flour, 70 percent of the fat in besan flour comes from healthy unsaturated fats that can lower cholesterol. The same portion has 5 grams of fiber. One-half cup of besan flour has 201 micrograms of folate, compared to 26 micrograms in whole-wheat flour and 182 micrograms in enriched white flour. If you consumed an entire half-cup of besan flour, you’d get 50 percent of the recommended daily intake of folate. This important vitamin is critical for the production of proteins and genetic material. In this role, folate is especially important during periods of rapid growth. When taken before and during pregnancy, it helps prevent birth defects of the brain and spinal cord. The same portion of besan flour is a good source of thiamin and vitamin B-6. Thiamin converts food into energy, while vitamin B-6 is needed for the synthesis of red blood cells and the neurotransmitter serotonin that regulates appetite and mood. Besan flour delivers a boost of iron, magnesium and phosphorus. Well known for its role carrying oxygen, iron also functions as an antioxidant and it’s needed for the production of collagen. Magnesium causes muscles to relax, which helps maintain vascular health and regulates blood pressure. Phosphorus combines with calcium to form the primary compound used to build bones. It also carries lipids through the body and activates enzymes that produce energy. One-half cup of besan flour has 2 milligrams of iron, 76 milligrams of magnesium and 146 milligrams of phosphorus. Besan flour is usually mixed with water, olive oil, yogurt or milk to make a paste that can be any consistency depending on the desired use. The paste is seasoned with any combination of parsley, cumin, coriander, turmeric, red chili, rosemary, onion or garlic. It’s traditionally cooked in a skillet to create a flatbread called socca or fried into fritters. Use a thick besan flour batter to coat and fry vegetables or add small shrimps to a thin batter and fry them into appetizer-like pancakes. Besan flour doesn’t contain gluten, so it makes a good substitute for wheat flour in gluten-free diets. Depending on the food you’re making, the bean taste may not create the best result. Try mixing besan flour with white rice flour, making sure that the total amount is the same that’s called for in the recipe. You’ll probably need to adjust the fluids to create the same consistency achieved with wheat flour. If you’re making yeast dough, you’ll need to add about 1 teaspoon of guar or xanthan gum for every 1 cup of flour so that the yeast can rise.